The hotpot menu tonight included appetizers like Chinese pancake. 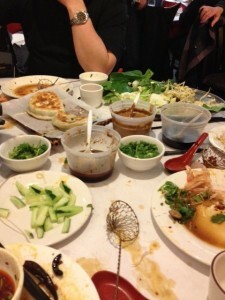 Then we got ready for the hotpot. 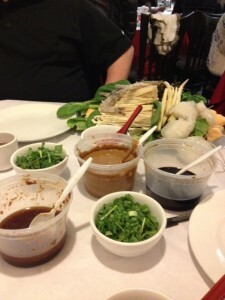 The waiter brought out sauces, green onion, and cilantro. 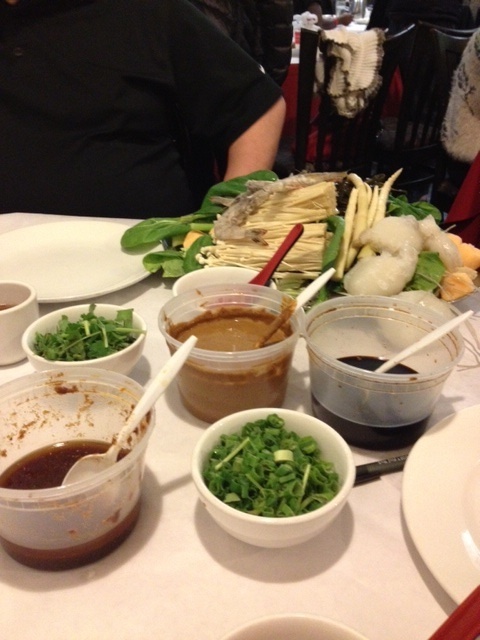 Behind it is a large plate of vegetables, tofu, vermicelli, and seafood. We ordered the Sichuan-style mala broth (the red one) and non-spicy chicken broth (with tomatoes, green onion, and Chinese dates). 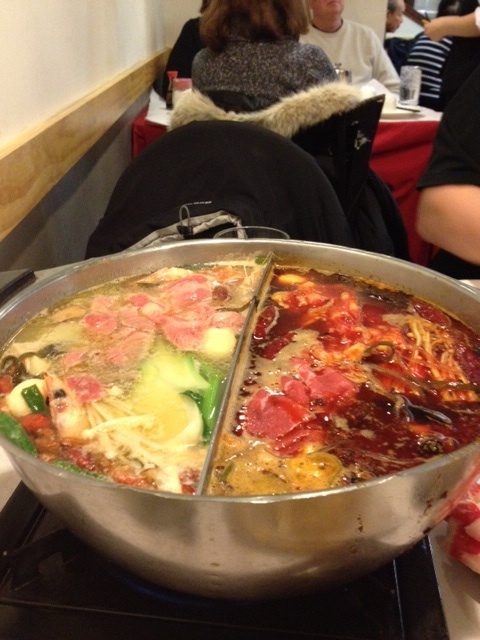 We took turns placing meat (thin slices of beef and lamb), vegetables, and the rest into the boiling broth. The waiter asked if we needed more of anything, including extra chili peppers. It was plenty spicy, so we left it as is. Sichuan hotpot is both spicy and numbing, but this wasn’t as out of control as the hotpot I ate in Chongqing one summer 18 years ago. When the waiter came back and asked if we wanted wheat noodles, I agreed to that. 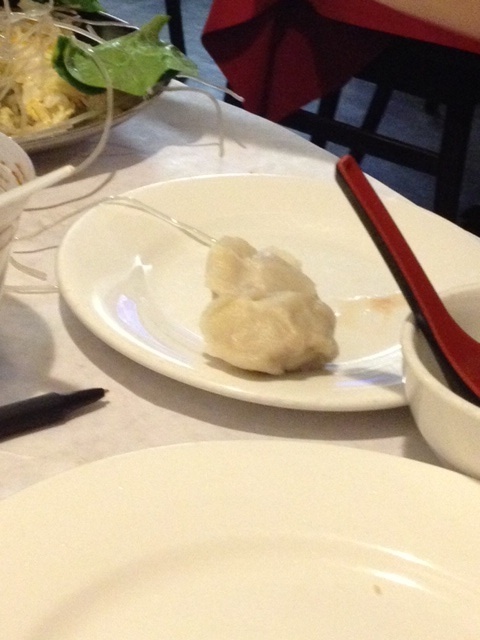 It was a fun evening, a good chance for me to practice Mandarin, and a tasty dinner that made us forget for a couple of hours the winter weather outside. 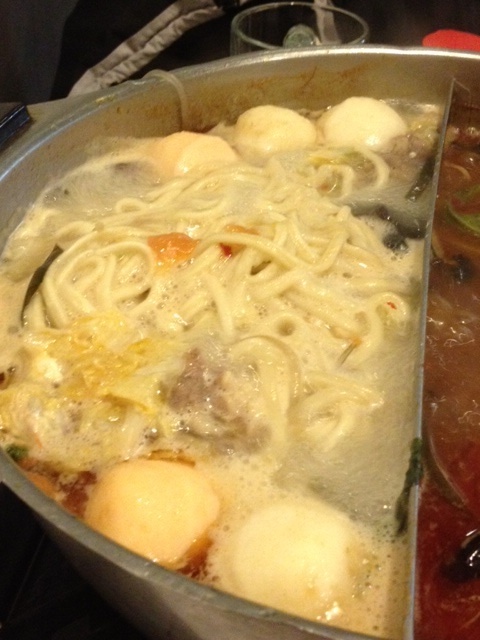 Mmmm… hotpot. Love hotpot, love the little individual ones at the Xiabu Xiabu chain of stores… love their Tom Yum Gong version. It’s a good trick to get people together (well, around a big one, the Xiabu Xiabu’s a bit more solitary by nature). Glad you enjoyed it – thanks for the pictures! We passed a Xiabu Xiabu place (called Shabu Shabu) in Chinatown, which I know is Japanese. But we were in the mindset to eat Sichuan hotpot that night. 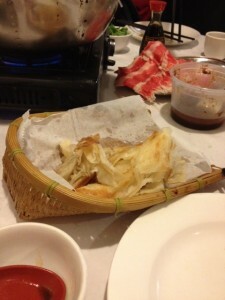 Next time we’ll try Xiabu Xiabu. I haven’t eaten that in years and forgot it was ordered more on an individual basis.